Free advertising for "Big Pharma"
I always thought flu shots were taken at the beginning of flu season, not the end. Is there something not being said? The H1N1 going around just turned deadly? No, that's not it. Ah, they have millions of unsold flu shots that can't be used for next year! That's it. I thought there was a specific time of year that is the best time to have a flu vaccine, hasn’t that already passed in Thailand? Is it still worth having? I recently returned from Australia and wanted to have latest flu injection before returning to Thailand.. No stock available anywhere until early April.. And i believe their 2019 batches are a 4 strain quad injection..
Is Thailand using last year's flu strain, how effective is it and how much do doctor's clinics and hospitals charging for it? I just had influenza type b complicated with pneumonia and a throat infection. 10 days of brutal symptoms, 7 days in hospital and 5 days home recovering so far. We got our shots a couple of weeks ago cost 700 baht each. 30 people die on the road each day, but people need to get a poison shot, this one actually contains mercury and other adjuvants. They even ask pregnant women to take, and guess what... higher risk of autism. You old people 65+ and older, rich on TV here, it does not work as good for older people as your immune is already weaker. Immune senescence : immunosenescence refers to the gradual deterioration of the immune system brought on by natural age advancement. It involves both the host's capacity to respond to infections and the development of long-term immune memory, especially by vaccination. But ignore these facts. Run for your life. This probably sounds Chinese for most people here. Sorry dudes, you get sick when you tell your immune system to go sleep for a few hours and this happens when you have that nice bulk of sugar 3 to 6 times a day. the flu shot is a GUESS based on what strain was active LAST YEAR. This is like going to the casino and bet everything or red, black or a number. But please, all go get a flu shot ... less people around is good ! And big pharma will be happy for your contribution to their profits. had conflicts of interest with big pharma... don't be shocked, it happens all the time. My mother worked all her carrier with children, coughing, sneezing, hackling, ... she never got a flu shot, she never got the flu. When people around me are sick, or when a lot of children in the school are sick, my kids also know to NOT LOWER their immune and avoid sugar. You see many times with their big cup of cha thai or coffee... So not much hope, but hey, at least they got their flu shot. Everybody happy. what did they serve you as food in the hospital ? Our local private clinic received new flu shots last week. We had to wait a few days for the shipment to arrive for our 2 year old daughter. But we live upcountry, not close to any big city, I am not sure if cities / hospitals somehow have more difficulty in receiving shipments. 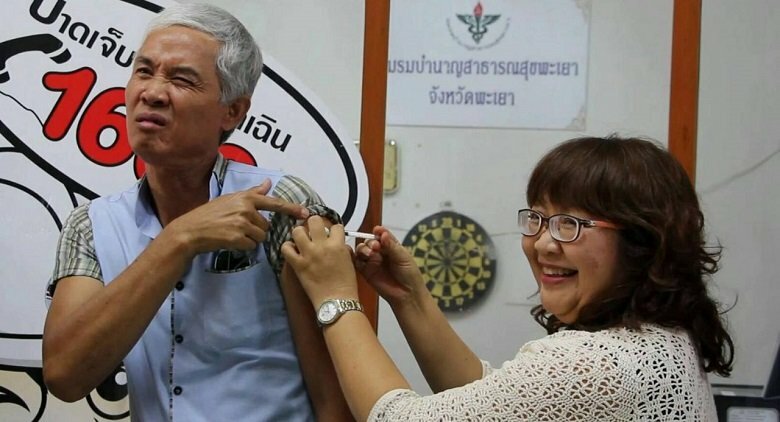 The beginning of flu season is coming up for Thailand (rainy season) - so yes it is the time to get shots. Ah, they have millions of unsold flu shots that can't be used for next year! That's it. Shares in these huge pharmaceutical companies are only going to go up as peoples health fails and they look for easy alternatives that the seller states "may" work. Yes I well remember when people were dying every year from influenza before we had any flu shots. Some of us made it but many others did not and at best you could count on several weeks of living death almost every year. Yes things were so much better then. Not. Mostly I agree. But in 1918, 100 million people would have regretted not having a vaccine for the H1N1 Spanish Flu, had they lived.